“What does it mean, to rediscover an unknown continent through the medium of photography in the 21st century? The seven artists that appear in this “Unfound in Australia” issue are well versed in the photographic technique and language familiar to modern art, yet show cultural distinctness that is nothing short of extraordinary. Our readers might experience a sense of shock or alienation from their work, which combines the new with the old. This kind of unsettling feeling may very well be an unconscious reaction to what we consider to be the ‘other.’ It is my hope that our readers will rediscover the power of photography as a chronological and visual language through these works of long underappreciated modern Australian photography. My text that appears in IANN magazine Vol.8, “Unfound in Australia” (October 2012) on the art of Jacqui Stockdale is a reworking of the review of her exhibition Jacqui Stockdale: The Quiet Wild at Helen Gorie Galerie in April – May 2012. It is a good piece of writing but it is the “lite” version of the text that I wrote. Instead of the “heavy” version fragmenting away on some long forgotten backup hard drive, and for those of you that like a little more conceptual meat on the bone, it is published below. Other artists featured in the Volume 8 edition of IANN magazine include Marian Drew, Henri Van Noordenburg, Justine Khamara, Magdalena Bors and Christian Thompson. 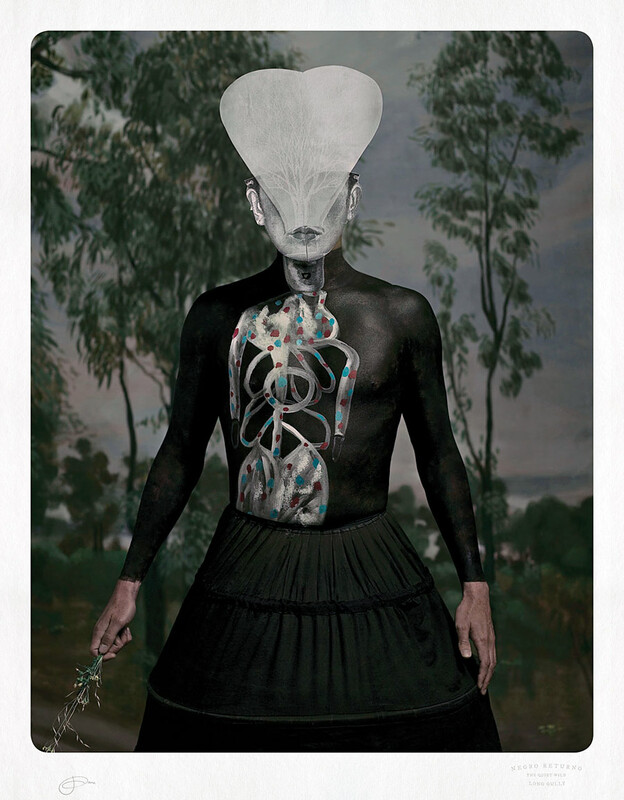 The concept of Orality is important in the art of Australian Jacqui Stockdale for her works are visual tone poems. Portraying identities in flux, her mythological creatures rise above the threshold of visibility to engage our relationship with time and space, to challenge the trace of experience. Stockdale uses the body not as passive object but as descriptive and rhapsodic theme, the body as pliable flesh acting as a kind of threshold or hinge of experience – between interior and exterior, viewer and photograph, longing and desire. Drawing on personal places and stories, assemblage and performance (the process of painting the models and the outcome of this interaction), Stockdale creates a wonderful melange of archetypal characters that subvert traditional identities and narratives. Her creatures “shape-shift” and frustrate attempts at categorization and assimilation. 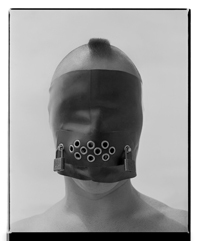 An example of this inversion can be seen in her latest series of photographs, The Quiet Wild (2012). Here Stockdale unsettles traditional textual readings, the titles of her photographic portraits indecipherable to the uninitiated, a coded language of identity and place. Lagunta, Leeawuleena and Jaara for example, are three Aboriginal names meaning, respectively, Tasmanian Tiger, the name for the land around Cradle Mountain on that island and the name for the Long Gully region around Bendigo, Victoria (Stockdale’s native area); El Gato is the cat and Gondwanan the name for the southernmost of two supercontinents (the other being Laurasia) before the world split apart into the structure that we known today. This intertextual (n)framing (n meaning unspecified number in mathematics) encourages the viewer to explore the inbetween spaces in the meta-narrative,“and by leaps (intuitive leaps, poetic leaps, leaps of faith)”7 encourage escapism. Through the (n)framing of the body and the enactment of multiple selves Stockdale narrativises her mythological creatures, her charged bodies initiating new conditions of Otherness in the mise-en-scène of being. This is why her images are so powerful for her art approaches Otherness using a visual Orality and a theatrical openness that encourages disparate meanings to emerge into consciousness. It is up to us as viewers to seek the multiple, disparate significances of what is concealed in each photograph – in the myth of origin; in something that can’t be explained by man; in the expression of meaning of the things that are beyond us. Vercoe, Caroline. “Agency and Ambivalence: A Reading of Works by Coco Fusco,” in Fusco, Coco. The Bodies That Were Not Ours. London: Routledge, 2001, p.240. 2. Stockdale, Jacqui. Artist statement 2012. 3. Intertextuality “is always an iteration which is also a re-iteration, a re-writing which foregrounds the trace of the various texts it both knowingly and unknowingly places and dis-places.“ Intertexuality is how a text is constituted. It fragments singular readings. “The reader’s own previous readings, experiences and position within the cultural formation” also influences these re-inscriptions. Keep, Christopher, McLaughlin, Tim and Parmar, Robin. “Intertextuality,“ on The Electronic Labyrinth website [Online] Cited 13/11/2011. elab.eserver.org/hfl0278.html. 4. Fisher, Jean. “Witness for the Prosecution: The Writings of Coco Fusco,” in Fusco, Coco. The Bodies That Were Not Ours. London: Routledge, 2001, pp. 227-228. 6. Bacon, Julie Louise. “Liquid Archive: On Ambivalence,“ in Liquid Archive. Melbourne: Monash University Museum of Art (MUMA), 2012, p.119. 7. Kirshenblatt-Gimblett, Barbara. “The Museum – A Refuge for Utopian Thought,“ in Rüsen, Jörn; Fehr Michael, and Ramsbrock, Annelie (eds.). Die Unruhe der Kultur: Potentiale des Utopischen. Velbrück Wissenschaft, 2004. In German.